Computerized Information Management Systems (CIMS), ie, EHRs and computerized physician order entry, can potentially improve health care quality, particularly by reducing errors. Adoption of the technology is steadily increasing but varies greatly among facilities. To identify the gaps in CIMS adoption, a recent study conducted by Joe Lintz, MS, RHIA, HIM program director at Parker University in Dallas, examined whether adoption differed significantly between rural and urban health care facilities in Texas. 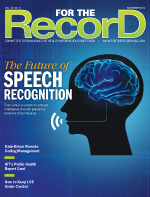 "The study showed that recording patient history and demographic information, and recording and charting vital signs were used more than any other functions—60% of CIMS usage time," Lintz says. However, location also played a part in which functions providers tended to use. According to Lintz, "Urban locations more frequently use the functions of recording patients' medications and allergies and reconciling lists of patient medications to identify the most accurate list than rural locations. In contrast, rural locations more frequently utilize functions of ordering prescriptions, recording patient smoking status, and recording clinical notes." Lintz, who designed the study to determine whether there was a difference in the average number of providers using CIMS based on geographic location, found CIMS usage was higher in rural locations. "The study showed that there were about 80% of the providers in rural locations using CIMS at the time of the survey as opposed to only about 50% in urban locations," he says. "That is interesting because most people thought that there were ample resources in urban locations and, therefore, urban locations would do a better job of using CIMS." Since a facility needs financial resources to adopt CIMS, the allocation of resources and funding at each location played a key part in adoption rates. In addition to funding, the type of provider using the technology as well as the providers' training and experience also impacted adoption rates. Study respondents indicated whether they were a physician, nurse, or other specialty care provider. Interestingly, the study found that nurses and other specialty care providers more frequently use CIMS than physicians, Lintz notes. Additionally, the study found that CIMS users, regardless of rural or urban location, tended to be older providers with more than 15 years of experience. "Providers' clinical experience, providers' continuing education trainings in the computerized systems, and frequency of interactions with the patients are the major factors leading to higher or lower adoption," Lintz says. "In other words, the more clinical experiences, continuing education, and interaction with patients, the better the adoption rates." According to the study results, the physician practices that were highly impacted by CIMS were those with the longest experience using the systems and that make the most use of the systems' capabilities. While training leads to higher adoption, providing the standardized CIMS training session within the facilities was the common key challenge among the providers in both rural and urban areas, the study found. However, there are several alternative steps that providers might take to address this challenge, according to Lintz. "For example, developing an in-house training plan to accommodate each facility schedule and organization culture, providing incentives for those providers who attend the training session, or perhaps a training session can be incorporated into an individual professional development plan," he says. Lintz found that most providers had a positive experience using CIMS. "There was only a small percentage of providers (15%) who expressed frustrations about using CIMS due to the complex functions within the CIMS," he says.